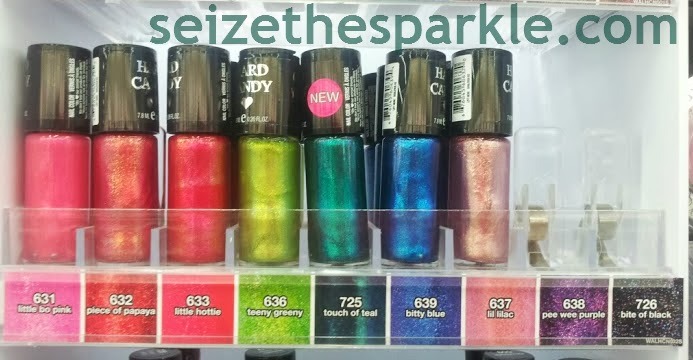 left to right: Crush on Pink, Crush on Gold, Crush on Hot Pink*, Crush on Amethyst, Crush on Ivy, Crush on Caribbean, Crush on Raisin, Crush on Tin, Crush on Lava. I picked up Emerald's Eve. 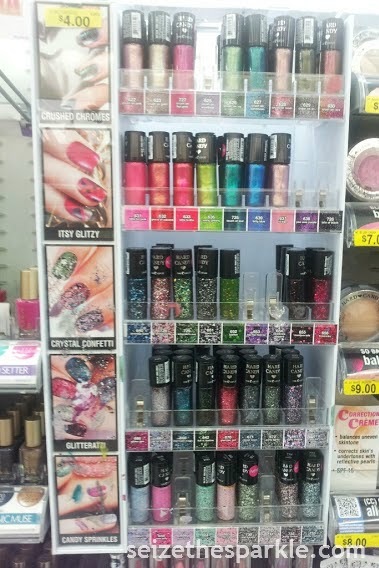 Sweet Tart and Bite of Black were the only two new polishes NOT stocked when I saw the display. I can't say I'm too interested in Sweet Tart, but look at Bite of Black... so preeeeeetty. With the addition of 9 new shades to the permanent display, that meant 9 shades had to be discontinued. Will they be back next Spring? I wouldn't count on it. If you've been wanting these and you see them, I would pick them up while you still can! 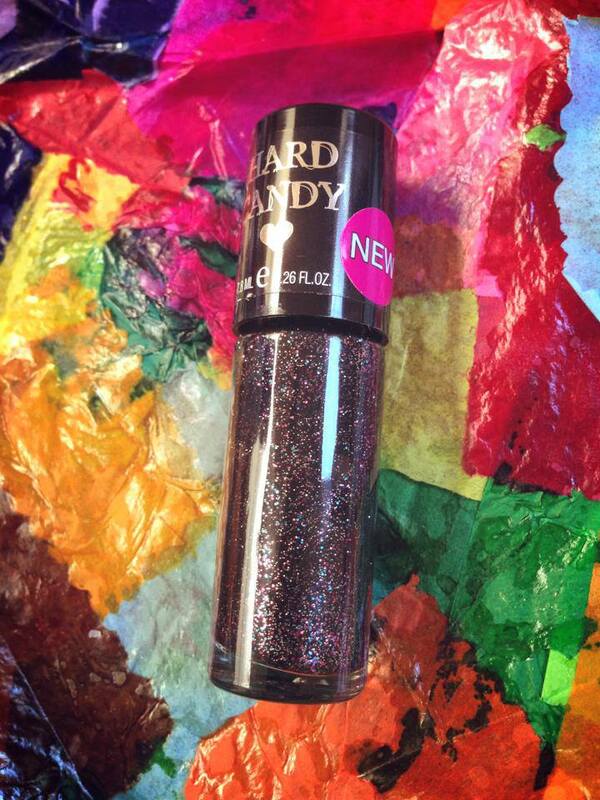 Have you spotted any of the new Hard Candy polishes at your WalMart? 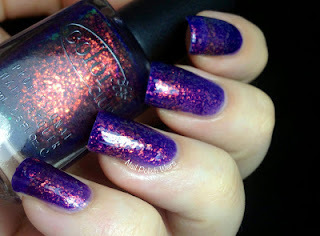 Polishes like this that just gloooow... Love.Them. I need more like this STAT! 2. 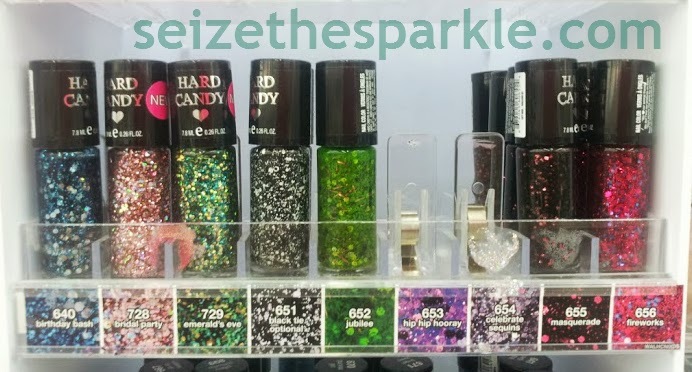 September is just two days away, and I've been on the hunt for Fall polish collection for 2 weeks, now! YIKES! Where did this summer go? 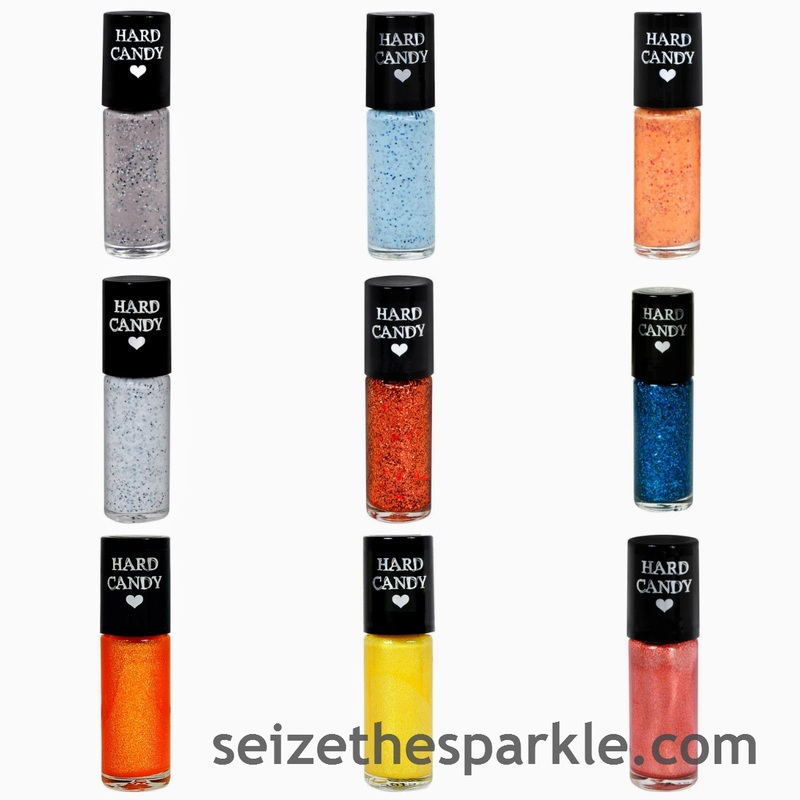 I've seriously been stalking the local drugstores for the Sally Hansen Xtreme Wear Rent the Runway collection. 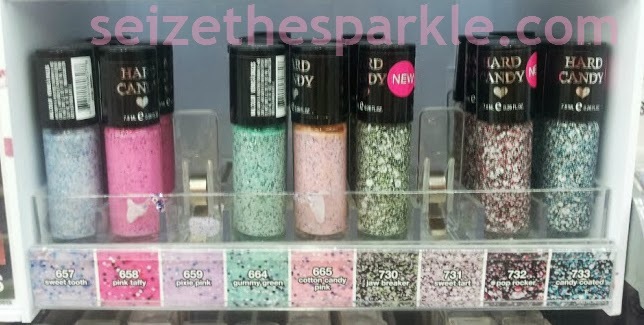 I'm also on the lookout for Pumpkin Polishes at RiteAid, Wet 'n Wild Tombstone polishes, the NYC Hero Collection, and the Fingerpaints Au Pair Collection. 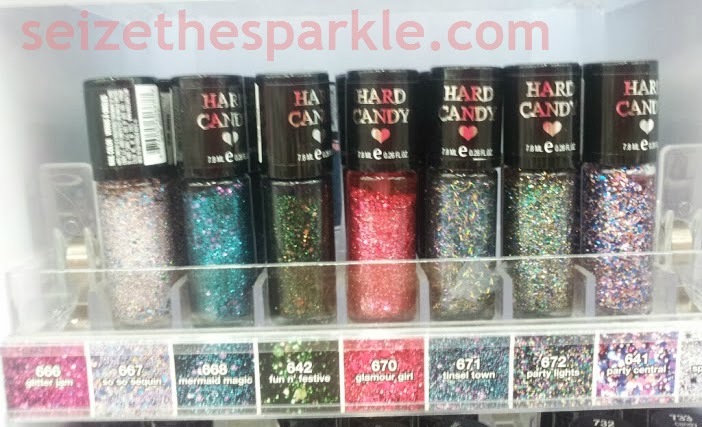 So, of course, when I went to WalMart yesterday, I happened upon 9 new Hard Candy polishes, instead. Go fig. In case you missed it, or just want to relive all the action over again, check out my recap here. I promise I'll be posting thoughts and theories soon! 4. I haven't pinned a lot of recipes lately, but I really want to try this one. 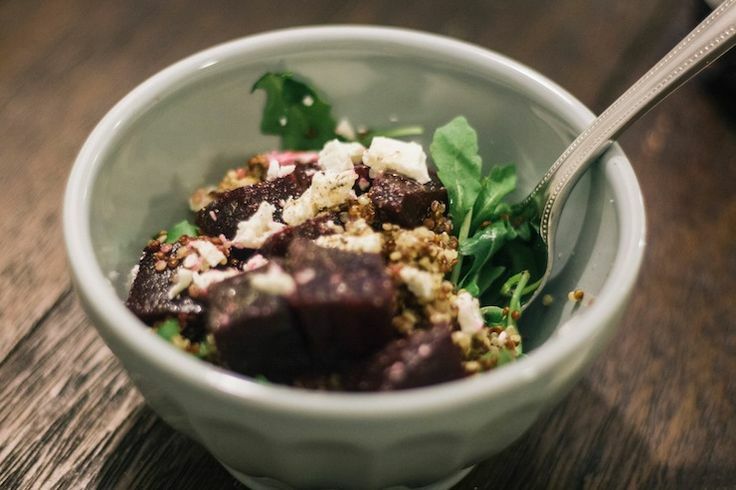 It has a couple of my faves in it, so it has to be superyummy, right? Just look at it. Even from inside my monitor, it's begging to be devoured. I get major foodie envy when I read Nat the Fat Rat. Likeallthetime. It makes me crave daytime at night, concrete sidewalks for days, and all. And that's saying awholelot considering my love for squishing grass between my toes. 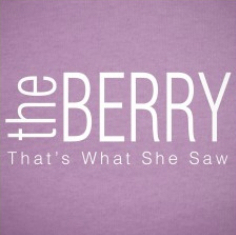 Mr. Sparkle has been a Chiver for a while now, and that's how I found their sister site The Berry. I'm so glad I'm not the only one. 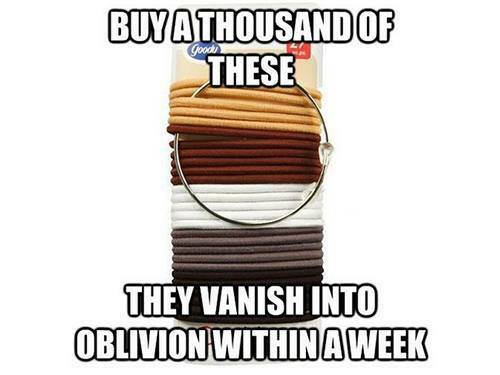 I have to admit, I was kind of excited to move earlier this summer, because I was sure I'd find a ton upon a TON of hairties. I found two. TWO! Damn house elf. Me & Inkiphone II. missyou. 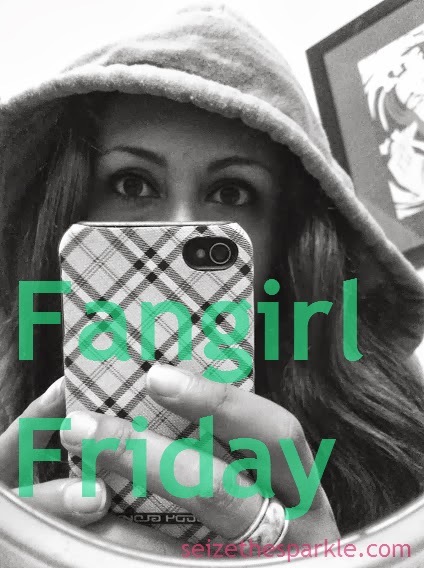 That's what I'm fangirling this week. How 'bout you? WhoA. Tuesday night's Mid-Season Finale did nawt disappoint. We picked up speed when Emily disappeared, and didn't slow down one bit. Last week's Hoedown has nothing on all the crAzies delivered this week! Remember last week when Travis finally came forward about what he saw? The Liars were all discussing it at Spencer's, when a package arrived at the door, addressed to all of them. Spencer wondered if this meant World War A.
Travis told Rosewood PD that he saw Mrs. Marin leave Wilden BEFORE he heard the gunshots. This week, it was time to pick her out of a lineup. After a nervous moment, he correctly picked Ashley out of the lineup. The D.A. came over to personally drop all charges against Momma Marin. Cut to Mr. Fitz talking to Aria's class about The Tempest. He asked her to stay after class, thanking her for talking to him after the dance. Aria said she was glad she could be there for him, but made a point to let Ezra know that they are still just friends. As she left his classroom, Jake called to discuss their plans for that evening. Ezra overheard their conversation, but didn't seem too thrilled. After school, the girls headed over to Hanna's house. Ashley left for a date with Pastor Ted and the doorbell rang almost immediately after. Realizing her mother forgot her keys, Hanna went to the door to give them to her, and instead found another package from A. Given how much Mona helped Ashley and the girls lately, Hanna was worried, and called Radley for an update. She found out that Mona had been released. The girls decided to split up and look for Mona. Since the Radley info was privileged, Spencer headed over to Wren's apartment. She knocked on the door, and when no one answered, took a peek inside. She found moving boxes, packed suitcases, and bare walls. Are you in there, Wren? Spencer noticed movement in the window, but she didn't see who was inside. Viewers saw Shana hiding just out of view, but Spencer may or may not have seen her. When she saw a certain car parked outside, she got a pretty clear idea of who might be hiding inside Wren's apartment. Emily took Paige along on her search for Mona at the French Club Fete. A student named Jackie told the girls that the soiree was supposed to be Mona's welcome-back party, but Mona never showed up. Across town, Toby was at the Brew, looking at a box of his mother's things. As he came down the steps, he noticed Shana gathering a stack of papers. She dropped one as she left, and it turned out to be a packing slip. Toby contacted Spencer immediately, and the two surmised that Wren and Melissa may have gotten back together. They finally talked about their fight at the hoedown, and Toby apologized for trusting A. He confided to Spencer, "Trying to break into Dr. Palmer's car? That's as close as I want to get to A." Hanna and Caleb drove over to Mona's house and set up an all-night watch from Caleb's car. Despite Caleb's misgivings about Mona, Hanna was determined to be there for her former BFF, and Caleb was determined to be there for Hanna. Aria kept her date with Jake, and the two were watching a movie at her house. Well, Aria was watching and snarfing kettle corn while Jake slept. He woke up, confessed to being super tired, and left for the night, saying he'd call Aria. She was understanding, but a little frustrated, and ended up heading to The Brew, where she ran into Ezra. She and Ezra began talking, and the show faded into a nice couple montage. (Seemingly, the calm before the storm.) Paige cuddled a sleeping Emily, Caleb cuddled a sleeping Hanna, Toby and Spencer cuddled, and Ezra and Aria shared a spontaneous kiss during their conversation. The camera pulled back to show Red Coat watching the pair through the window. The next morning, the Liars met up again, as none of them had found Mona. Another package arrived for the girls. This time, it was a black box typically used in magic acts. Spencer opened the trick box, revealing yet another message from A. The girls decided to drive to Ravenswood and catch the show, fearing that A might make Mona disappear. Toby joined Caleb outside Mona's house for Hardy Boys v2. Caleb hadn't slept much, so Toby took up watch and relieved him. Not long after, Jenna's Mustang peeled out of Mona's driveway, and Toby quickly followed in Caleb's car. Tobes checked in just as the girls made it to Ravenswood. He thought Shana was headed there, but they had just passed the exit and were still headed east. Aria, Emily, Hanna, and Spencer quickly found another sign for Charlemagne's Magic Show. Upon their arrival in the park, Hanna noted they were being watched by a very tall man. Charlemagne was performing his show, and just about to make an audience member disappear. He set his sights on Aria, doing a little mime begging and groveling to coerce her into joining him on stage. Aria tried to get him to take Spencer, but he was insistent on Aria performing the trick. Aria called Emily, who had been locked in a wooden coffin, that just happened to be on a conveyor belt headed straight for a giant band saw. Spencer's phone located a saw mill right around the corner, and as the girls looked up, they noticed Red Coat dash around the corner. Red Coat saved the day. The girls saw her walk away from the power switch, only to reappear a few seconds later on a higher landing. Wasting no time, Spencer ran after the Red Coat who saved Emily, while Aria chased the masked Red Coat up the stairs. Hanna pried the coffin open, finally freeing Emily. Aria and Red Coat got into a fight, and Aria's martial arts training really came in handy. She sparred with Red Coat, knocking off her plastic mask. Red Coat turned out to be CeCe Drake, just as the girls suspected. Aria urged her to give it up, but CeCe continued to fight. In an attempt to get away, she tried to climb a rope to safety, but the rope was rotten. CeCe fell, and Aria caught her by the sleeve. Aria tried to lift CeCe back up to the landing, but the sleeve on her coat ripped. CeCe fell, awkwardly landing on the concrete below. With CeCe seemingly dead, the girls took a moment to recover. Viewers saw CeCe's fingers wiggle as the girls were making sure Emily was okay. When the Liars looked over again, CeCe was gone. Not wanting to waste anymore time, Spencer urged the girls to follow her. She explained that the Red Coat she followed slowed down, almost like she wanted to show her something. Red Coat led them straight to A's lair. Inside the apartment, the walls were covered with large pictures of Alison, the Liars, their family, and their friends. On large whiteboards, A had timelines for each of the girls, displaying all of their secrets. But A wasn't just watching them, A was watching the streets of Rosewood and monitoring Rosewood PD with a computer. Instead of leaving immediately, like they did with the last A lair, the Liars set up camp, searching through the apartment. The girls found a closet with suits and mens shoes, suggesting that A is actually a HE, not a SHE. The girls didn't notice it, but behind the Halloween Train Poster, there was an eye visible in the pupil. Someone was watching the girls as they discovered A's lair. They found pictures of Ali BEFORE she disappeared. Hanna recalled a shirt Ali was wearing in one of the pictures. Alison had bought it while shopping with Hanna, confiding in her that it was for a date with an older boy that night. Inside the photo album, the girls found a note Alison wrote to Board Shorts, leading them to believe that Board Shorts must be A. They recalled the beach trip Ali had asked her mother about and realized that Ali never wanted to take the girls to Cape May with her. She wanted a weekend away with Board Shorts. Hanna found a small silver journal inside the lair, and slipped it inside her bag. Spencer found A's bank records during the search. A had set up an LLC, with money coming in and going out. Two payments were made that week to CeCe Drake. Spencer also noticed that the corporation's name, Shawnee, just happened to be the name of Ali's favorite beach in Cape May. The girls wondered if Wren could be A, but Aria suggested that couldn't be right, as A seemed to be watching him as well. Aria walked around the whiteboards to find something even more curious. Not only had A been tracking them, he had also been tracking Alison since her disappearance. A had Ali sightings and case information listed on the timeline, and put her at the Lodge the night of the fire. He had a picture of a costume on the board, along with an invitation to a party that evening in Ravenswood. The girls left the apartment, bumping into Mrs. Grunwald on the way out. She explained that the party that night was for invited guests only, but she also told the girls an interesting story. "The night she went missing, I felt something terrible. I drove to Rosewood. I walked into her backyard, and she was reaching for life. Her head was bloody, she was very confused, she was in shock. I put her in the car and I drove her to the hospital. I ran in to get help, when I returned, she was gone." "Haven't you all felt it? She was never really gone." According to Mrs. Grunwald, Alison is alive, but in terrible danger. She suggested the girls leave Ravenswood, as they are a danger to Alison. Her "sight" told her that A was in Ravenswood too, and that he was searching for Alison. If the girls stayed to look for Ali, they could lead him right to her. Grunwald's warning did little to deter the girls. Aria spotted a shop selling period clothes, and the girls decided to crash the party that evening. He was not too happy that his lair had been found out, slamming the door to the armoire. Toby followed Shana to River Valley Bed & Breakfast. Mona was on the porch knitting, as Shana walked over and gave her an envelope. Mona - You sure she's okay with this? Shana - She doesn't have a choice. Mona - Have a seat. As the credits closed, we saw someone putting on the old gas mask costume, likely getting ready for the party that evening in Ravenswood. That's the Recap. Stay tuned... I'll be posting my thoughts, theories, and predictions just as soon as my head stops spinning. Let the countdown to the Halloween Episode, "Grave New World" begin!